Excerpt read by Mallory Kasdan. 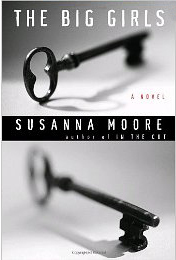 Susanna Moore’s new novel, “The Big Girls,” is set in a federal women’s prison. Dr. Louise forest is chief Prison Psychiatrist, a single mother who is highly intelligent and educated at the best schools. Rebellion from this elite background, coupled with guilt over a past patient’s suicide has brougth her to Sloatsburg Correctional Facility, where she counsels a woman who killed her own two children.